Does Nintendo's newest racing game look hotter in the third dimension? Read on to find out. With Super Mario 3D Land, Nintendo proved that glasses free 3D is more than a cheap parlor trick by making it a part of the gameplay. Switch it on, and it's much easier judging distances between platforms. Beyond that, fireballs and other projectiles take on a near holographic quality. It looks so cool, we played the entire game in 3D. Suffice to say, we wore out the system's battery more than once. 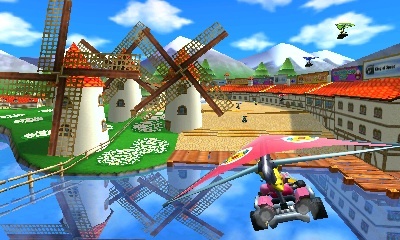 Nintendo does a wonderful job separating the karts from the backgrounds. That said, we held out hope that Mario Kart 7 would be equally impressive, and the big N has delivered yet again. Although the game runs just fine in standard 2D, we suggest cranking the 3D slider all the way up, or at the very least, adjusting it to your level of comfort. Here's the thing, though. 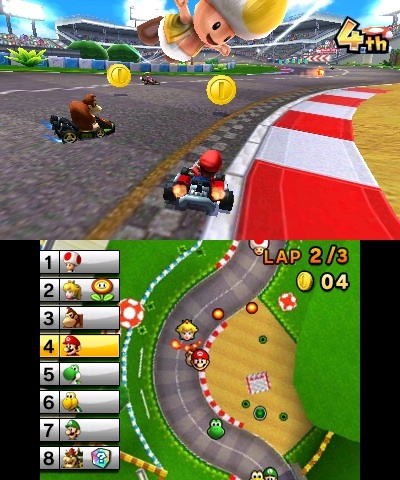 The 3D in Mario Kart 7 is so well done that it feels like part of the game, instead of an option. We love how it separates the selected kart and rider (be it Mario, Luigi or Princess Peach) from the background, making it seem like we can reach out and touch it. The same can be said of various effects. While exploring the Mario Circuit track, pink leaves (cherry blossoms?) slowly flutter towards the screen. Meanwhile, fireworks look extra special in 3D while puttering through Shy Guy Bazaar. You'll also notice objects that take on a wonderful sense of depth in the third dimension. Explore Toad Circuit, and you'll marvel at the humongous Toad balloon floating just a couple of feet off the ground. Choose Rock Rock Mountain, and you will literally dodge boulders while climbing a sharp incline. You'll definitely want to see those in 3D. Winning a cup, meanwhile, displays the trophy that you can rotate with the circle pad. Activate 3D, and it gives the illusion of said trophy rising up from the screen. That Toad balloon looks sweet in 3D. The best thing about this is the strain, or lack thereof, on the eyes. We're particularly sensitive to the 3D effects in other games, to the point where some make us visually fatigued. Mario Kart 7, though, strikes a perfect balance, to the point where we sometimes forget the 3D's on at all. To that end, this game (along with Super Mario 3D Land) is a shining example of what 3DS is truly capable of in the hands of skilled developers. Outstanding effort. In other news, look for our Mario Kart 7 review November 29.